What are the functions of a radiator cap? 1. It keeps the cooling system sealed from outside contaminants. 2. By keeping pressure on the cooling system, it raises the boiling point. 3. The radiator cap allows coolant to go to the expansion recovery tank when coolant gets hot, expands, and pressures increase. 4. As the system cools down, it allows coolant to return to the engine from the expansion recovery tank. A bad radiator cap can cause the engine to overheat at lower temperatures. This will cause the coolant to boil over to the expansion tank. A radiator cap that is faulty could also prevent coolant from returning to the engine. This would create a vacuum and cause the radiator hoses to collapse. Bought a Monster Radiator Cap from the SCSG at quite a good price. 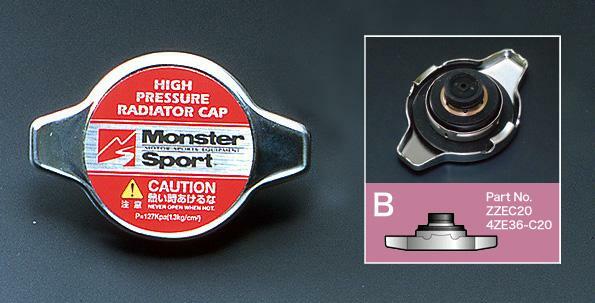 The Monster radiator cap runs at 1.3 bar which gives a higher pressure than the original radiator cap which runs at only 1.1 bar. Water boils at 100 degree celsius at a pressure of 1. A higher pressure will increase the water boiling point. Hence it is able to adsorb more heat from the engine before boiling and entering the radiator for cooling down. But there is a risk for the stock radiator to leak. Knowing the downside of this modification, I am still willingly to give it a try. Point to take note when changing the radiator cap. Change only when the engine is cold. Cover the cap with a piece of cloth before opening it.